"Reaching new goals and heights with help from our older friends"
With each New Year, we often set goals that allow us to challenge ourselves to achieve things that will benefit us. Sometimes, to reach those goals, we need help. Recently one of intermediate students set a goal of climbing the traverse wall backwards. After a hard fought first try, she was not met with success. Luckily, three of our middle school students stepped up to help. 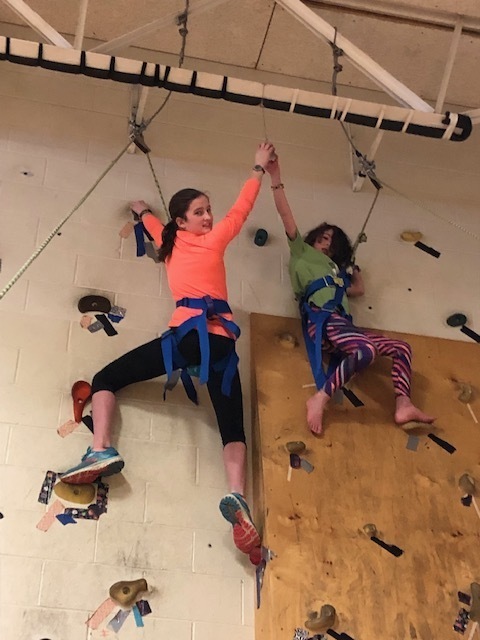 One was a belayer for our younger student, one climbed and was an active guide to help this student manipulate her hands, arms, and legs over the overhang, while another eighth grader belayed. Through this team effort, our younger student achieved her goal, proving that sometimes with the giving spirit of others and the leadership of our older students, one can meet success with a sense of accomplishment. One of the beauties of the Lyme School is the natural mentoring opportunities that happen across our school. Our younger students are able to take part in and witness those opportunities and this allows for those experiences to continue on. Fortitude, a positive attitude, gratitude, and help along the way is one of the best ways to get you where you want to be.